In Mr. Raber's US History class, students are learning about World War 1. One of the main staples of the First World War was trench warfare. The Central Power and the Allies both dug trenches in Eastern France, which led to the death of 35 million people for the gain of only about 50 miles in the 5 long years of the year. 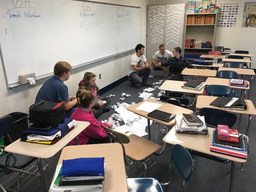 In order to simulate how trench warfare was fought, students built their own trenches using desks and fought with paper bullets and artillery. Students experienced how it felt to "go over the top" of their trench and walk through No-Man's-Land while getting "bombed" and "shot" by the other side.